Looking to make a difference this summer? Consider NBTB! We’re currently seeking highly motivated, energetic team leaders for our high school student journalism camp, to be held July 2 to July 9 at Stanford University, with staff training on Saturday, July 1. 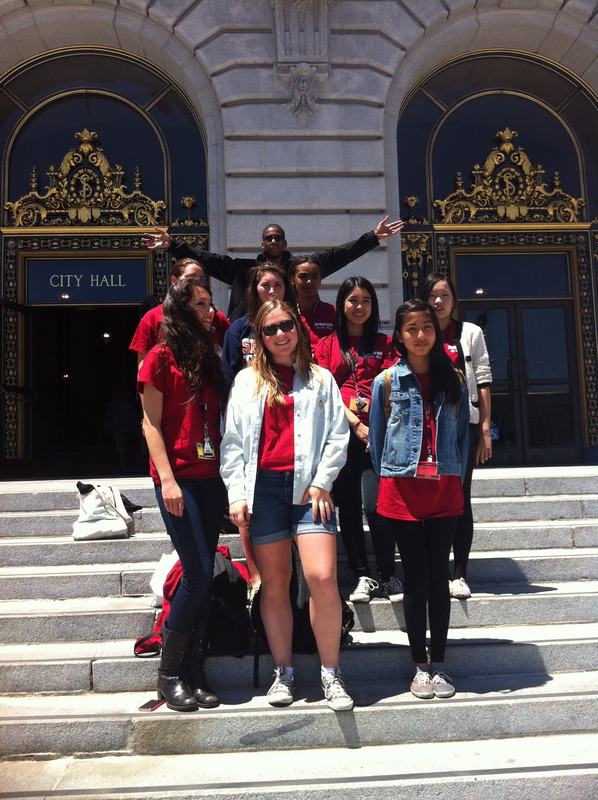 Team leader Brooke Stobbe, center, and members of the Flame team outside San Francisco City Hall, one of several locations they visited on their field trip to the city. Photo by NBTB students/staff. For information on teaching opportunities, please email us and include a resume: newsroombythebay@gmail.com. For information about our team leader program, please click here. For information about our counselor-in-training program for our returning students, please click here.